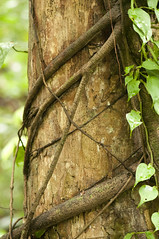 Strangler fig is the common name for a number of tropical and subtropical plant species, including some banyans and unrelated vines, including among many other species: They all share a common "strangling" growth habit that is found in many tropical forest species, particularly of the genus Ficus. This growth habit is an adaptation for growing in dark forests where the competition for light is intense. These plants begin life as hemiepiphytes, when their seeds, often bird-dispersed, germinate in crevices atop other trees. 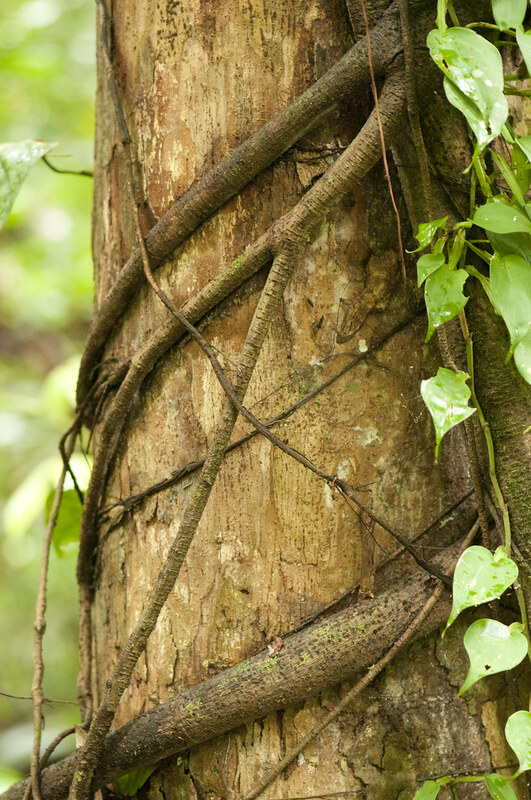 These seedlings grow their roots downward and envelop the host tree while also growing upward to reach into the sunlight zone above the canopy. An original support tree can sometimes die, so that the strangler fig becomes a "columnar tree" with a hollow central core.